Jema International Photo Award - Looking for purity | Gerardo Cesari S.p.A.
Jema by Gerardo Cesari and Compagnia Editoriale Aliberti present the first edition of the "Jema International Photo Award – Looking for purity". The award is reserved to photographers, professionals and beginners, without any limits of age or nationality, who will present a photographic work that represents purity for them. • Concept_ | what is purity? Purity is a word of profound suggestion that fades into meanings when, with grace and lightness, it passes from the world of wine to that of ethics, from the world of eros to that of gemmology. At the same time purity is the least understood and loved word of the contemporary age. But yet, without understanding the purity we don’t understand the world because we see it only in its dimension superficial and let us escape the vision of the most beautiful things. We lose, in this way, the hidden beauty in what surrounds us. Who is a depositary of purity doesn’t realize it, he can’t take possession of its own purity, it serves an external eye that will capture it and return it to the subject and to the whole world. That's why Jema by Gerardo Cesari and Compagnia editoriale Aliberti invite you to take part to Jema International Photo Award – “Looking for purity” and shape your personal idea of purity. Jèma is a name with a double meaning, it stands for precious gem but also for gem of the vine, indicating that the wine is the result of the best the plant can offer. "JÈMA" CORVINA VERONESE IGT produced by Gerardo Cesari’s winery is born from the desire to enhance a fundamental wine variety of Valpolicella’s area, the Corvina. It’s in purity, like in Jema, that we can appreciate its different expressions in color, perfumes and richness. The jury (the composition below in the following paragraph) will evaluate the candidated photographic works in the Pro category and, among these, it will select TWENTY finalist photos. All the finalist photos will be exhibited at the vernissage, helded in Verona in April (location in the city center to be defined). Among these twenty finalists it will be proclaimed the winning work of the Award, announced during the exhibition. - will have their photo exposed in a preferred position during the already mentioned exhibition. - will be hosted, with a date of theirs, by Gerardo Cesari for a weekend, in the occasion of Vinitaly 2019 (including entrance tickets for the wine event). -	3 liters of Amarone with a plate. -	his photo will participate in the final exhibition, together with the photos of the Pro category. - the participation of their photo at the final exhibition of the Pro category. -	a magnum bottle of Jema will be given to each one. The Compagnia editoriale Aliberti editorial committee will assign a special mention to three photos. These photos may be selected from both the prize’s categories and they may be used as a cover image for future publications of the publishing house. 1) the application form for the competition at the bottom of this announcement, or downloadable from the website www.cesariverona.it or www.aliberticompagniaeditoriale.it, complete in every voice. 2) the candidate work for the competition complying according to the technical requirements presented in the Notice of participation attached below. “Brahmino”, nickname of Simone Bramante, is the most followed italian professional photographer on Instagram. He was born in Syracuse, he grew up in Finale Emilia, he has studies in Literature in Bologna and he has projects all over the world. He is a vanguard in the advertising world such as creative director: Ford Usa, DiSaronno, Ducati, Volvo, Absolut, Maserati, Samsung, Unicredit, Hotel Marriot and other brands have discovered him thanks to the Instagram profile. His series, “Mind the clouds”, is very well known; he is the founder of the collective “What Italy is”. Silvia Camporesi was born in Forlì in 1973 and she graduated in philosophy. Through the languages of photography and of videomaking she builds stories inspired by myth, literature, religions and real life. In the last years her research is dedicated to the italian landscape. Since 2003 she holds one-man shows in Italy and Abroad. In 2007 she won the Celeste Prize for photography; she is among the finalists of the Talent Prize in 2008 and of the Terna Prize in 2010; she won the Francesco Fabbri Award for photography in 2013, the Rotary award of Artefiera 2015, and the BNL Award 2016. She has published three photographic books: La Terza Venezia (Trolley, 2012), Journey to Armenia (Quaderni di Gente di Fotografia, 2014) and Atlas Italiae (Peliti Associati, 2015). Public and private collections keep her works including: MAXXI Museum, Rome; BNL Group, Milan; Donata Pizzi Collection; Mario Trevisan Collection. He is Comix’s editorial coordinator, Mondadori’s editor and author of many books. He is the Aliberti Lab’s creative director. Journalist, former cinema and theater press-office, writer, publisher. He graduated in modern literature, with a musical and theatrical training; he has always worked with publishing and cross-media communication, in a research that favors languages and disciplines interweaving. 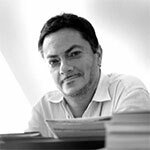 He published the novel “La stanza del principe”, with which he won the 2015 Mazara del Vallo Award. He is one of the founders of trekking-yoga. 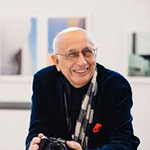 He approaches photography in the 1960s. In 1963 he exhibited at the Vienna’s Colour Biennal and in 1968 he has his first one-man show in Modena. He begins a long career studded with successful exhibitions and publications. In 2006 he received an honorary degree conferred by the Faculty of Architecture of the Polytechnic of Turin. From the beginning, Fontana dedicated himself to landscape photography, enhancing colors and geometries, which is why his research has often been associated with painting. However, his works are exclusively born within the photographic language of which he has been exploring for years limits and possibilities. She was born in Milan but she is Veronese by adoption: at first she had an hospitality training in Alto Adige, then she obtained a Master's Degree in Educational Research in Verona. She attended AIS Courses and those of A.I.B.E.S in Milan, in 1995. Since 2003 she has worked for different realities, as responsible for communication and implementation of cultural events. She arrives in Cesari about 6 years ago, start developing the whole part dedicated to hospitality, to winery tasting and to events. Three languages, good nose, critical eye and a great passion for wine, of course Cesari (but not only! ).